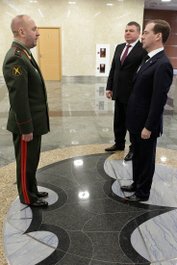 President Dmitriy Medvedev, accompanied by Defense Minister Serdyukov and General Staff Chief Makarov, paid a visit on GRU headquarters yesterday. Medvedev came to bestow state awards on GRU officers. Presidential visits to the home of Russian military intelligence are rare, and usually come in connection with its anniversary (November 5). So we have to suppose the lame-duck Supreme CINC and possible future prime minister went to the GRU to (a) bolster its newly-appointed chief, General-Major Igor Sergun, and (b) try to boost the morale of a service hard-hit by cuts and reorganizations under Serdyukov’s reforms. Medvedev’s brief remarks seemed to confirm as much. Medvedev’s “on the whole” was a recognition of a state of affairs that is something less than fully optimal. How much we don’t know. He also seemed to be dealing with an audience more accustomed to, and happier with, operations than analysis. The president went on to note the GRU’s traditional role in monitoring the global political-military situation, forecasting threats, tracking military-technical and defense industrial developments, and, especially, in counteracting international terrorism. Kremlin.ru provided this video of Medvedev’s remarks. This entry was posted in Military Leadership, Officer Corps, Serdyukov's Reforms and tagged Dmitriy Medvedev, GRU, Igor Sergun, Main Intelligence Directorate. Bookmark the permalink.